First patented in 2004, the Mr. Clean Magic Eraser, a melamine foam sponge—which was billed as one of Time Magazine’s “Coolest Inventions” of that year—has since been busy removing dirt, grime, and sticky stains from everything from shoes to stovetops. 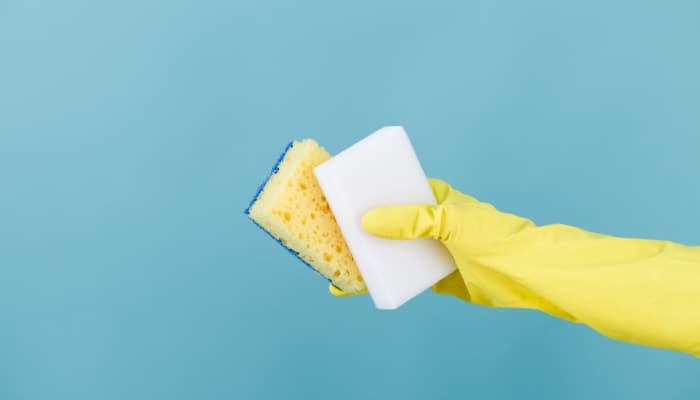 Learn more about how this unique sponge works, the many ways in which you can utilize its cleaning powers, and a few things you should never use a Magic Eraser to clean. How Does A Magic Eraser Work, Anyway? Although a Magic Eraser looks like an ordinary sponge in many ways, this unique cleaning tool is actually made from melamine foam. Melamine resin is a versatile plastic that is created by mixing melamine with formaldehyde; when this resin is used to create foam, the final product is an ultra-fine abrasive that’s similar to sandpaper. Adding the power of water retention to this microscopically gritty sponge gives it a cleaning power that is truly magical. In addition to the seemingly obvious uses for a Magic Eraser (like scrubbing soap scum out of showers and sinks, cleaning scuff marks from walls, and wiping burned-on spills from an induction cooktop) there are dozens of other situations in which a Magic Eraser is truly a secret weapon. If you have children (or have hosted children) who tend to view your bare walls as a canvas, don’t fear cleanup—the Magic Eraser can handle both waxy crayons and penetrating markers, even permanent markers. For households with hard or iron-heavy water, rust stains on porcelain can be tough to get rid of. But a Magic Eraser makes short work of these stubborn red and brown streaks, easily restoring your bath, shower, or tub to like-new condition. If your tile is looking dingy, a good scrubbing with a Magic Eraser may be enough to bring back that bright white grout. And if you’ve caulked around the edge of your sink, shower, or tub, this eraser can remove stains and grime that could potentially degrade the caulk seal over time. Whether you have hairspray build-up on your curling or straightening iron, the sticky remnants of a label on a glass jar, or another type of hard-to-remove stickiness, a Magic Eraser can break down these gluey bonds quickly. Whether you’ve got a dusty dashboard, a smeared windshield, or sticky leather seats, a Magic Eraser can give your car that brand-new appearance again (albeit without the new-car smell). If you’re dealing with a stubborn stain that even pricey laundry detergent won’t remove, try using a Magic Eraser. Often, this abrasive surface can be just the trick for stains that seem impervious to other cleaning agents. It can even remove blood stains in some cases. Over time and with exposure to salt, hard water, and road dust, your vehicle’s headlights can become dingy and dull. A few quick swipes with a Magic Eraser may be all that’s needed to restore your headlights to new. One fun experiment involves placing a Magic Eraser in your toilet’s water tank. As the Magic Eraser remains waterlogged, it will slowly release its micro-abrasive particles as it dissolves, helping keep your toilet bowl clean and sparkling. Because silver is generally hard enough to resist scratching, it’s a great candidate for a good cleaning with a Magic Eraser. Remove tarnish, water spots, and other discolorations without using harmful chemicals or tarnish removers. While a Magic Eraser can seem like a fairly innocuous cleaning tool, its micro-abrasive surface isn’t a good idea for certain materials. Here are just five of the things you should never use your Magic Eraser to clean. The abrasive surface of a Magic Eraser is almost certain to leave tiny scratches in your car’s paint job. Resist the urge to use a Magic Eraser to get your vehicle super-clean; instead, opt for cleaning tools that are specifically designed for vehicles. Some countertop surfaces are quite delicate. Using a Magic Eraser on marble or granite countertops can scratch them; and while you may not notice this damage at first, over time, the use of abrasive cleaning products can lead to pitting, discoloration, and cracks. Magic Erasers are so good at removing surface dust and grime, they’re a poor choice to use to clean fine china or other delicate dishes, as they may scratch the surface or remove patterns. Unless you’ve used a Magic Eraser on a certain surface before (or know, beyond a doubt, that the surface is Magic-Eraser safe), it’s a good idea to do a small spot test in an inconspicuous area. This test will reveal whether the Magic Eraser might damage the surface and help you avoid causing a much larger mess than the one you’re trying to clean. With these Magic Eraser tips, tricks, and cautions, you’re ready for just about any cleaning project that comes your way! But if you’re ready to take the next step toward improving your home environment, consider hiring an outside cleaning company like Companion Maids. Our flexible scheduling and experienced staffers can help you get your home into ship-shape on your schedule and at your convenience.